Undergraduate student Derek Lee blogs about studying abroad in Shanghai. It can be easy to think of each custom as an arbitrary tradition, but together, these many little things add up to what Chinese culture is today. That’s what’s beautiful. For me, Chinese New Year was one of the few days of the year that really brought family together. It reminded us that somehow, somewhere, there was more to who we are and what we stand for. We would chat, play games, and eat a lavish dinner with homemade dumplings, fish, and of course, gao, a popular Chinese New Year dessert. A part of me was always left wondering, though, what would Chinese New Year actually look like in China? And what did Chinese New Year really mean if not to give us the opportunity to eat gao? 1. Regardless of social economic background, everyone goes out to buy new clothes to wear for the New Year. It can be difficult to imagine that despite only making just enough to support their own living, many people still make the effort each year to go out and buy new clothes. Even if it were not expensive, wearing something new would bring a fresh new start and good luck to the New Year. 3. 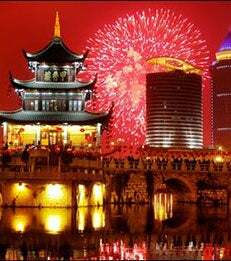 Chinese New Year is celebrated for 15 days. In addition to celebrating the onset of the new lunar year, people also devote this time to revisiting family members, giving thanks to deities, and paying homage to deceased loved ones. 4. Setting off fireworks before each meal. Part of the fun in living in a rural area is that you get to do things you might not be able to do in a big city. For example, setting off fireworks in your backyard. And not just on midnight before the first day, but every day, and before every meal. 5. People like to push things off until after the holiday. As the year comes closer to the end, many people begin to start settling into the holiday mood and leave their problems to be tended to after the New Year. Doctors may postpone surgical procedures, businesses begin closing (as many return back home to their relatives, wherever that may be in China), and even people seeking to start gym memberships wait until after the New Year celebration is over. 6. Red and yellow socks. A must get. 7. Wrapping coins inside dumplings. As we sat around the table making dumplings, I was quite taken aback when they started adding coins inside the filling. Within a batch of hundreds of dumplings, 10 would have a coin in them. And whoever bit on one would be deemed to receive prosperity and wealth in the New Year (I personally like to add hot chili peppers too to spice it up a bit). 8. CCTV New Year’s Gala. It is the single most watched television event in the world, uniting 700 million people across the globe. And regardless of race, age, social economic background, or upbringing, everyone can find something they enjoy or can relate to. It can be easy to think of each custom as an arbitrary tradition, but together, these many little things add up to what Chinese culture is today. That’s what’s beautiful. But there’s something else—something that speaks to the essence of the holiday. As I glanced around the dinner table to uncles, aunts, cousins, and grandparents, it was evident that really, none of the aforementioned things were that important. I’ve come to learn that it’s the same anywhere you go. As we all looked around, it was unanimously clear by the expression on our faces, that what really mattered, was getting to the gao first.